From The Birth Of The iPhone To An Era Of Lawsuits : All Tech Considered On the eve of the next trial in the continuing patent war between Apple and Samsung, one of the iPhone's original designers is speaking out publicly for the first time. One of the earliest iPhone prototypes. This system was pieced together to test early versions of the iPhone's software. Next week Apple and Samsung are heading back to court. The two technology giants have been locked in an ongoing patent battle for years. Round 1 went to Apple, with the Cupertino company winning a patent infringement case and a jury award that was initially larger than $1 billion. In Round 2 the stakes could be even higher, and within Apple this notion that the company's competitors stole its ideas is a grievance that many engineers and executives simply cannot let go. Until this week Greg Christie had never spoken publicly about his role designing the software and operating system for the first iPhone. Christie manages the software designers who shape Apple's human and machine interfaces. We met in a tiny, windowless room in Apple's Cupertino headquarters. 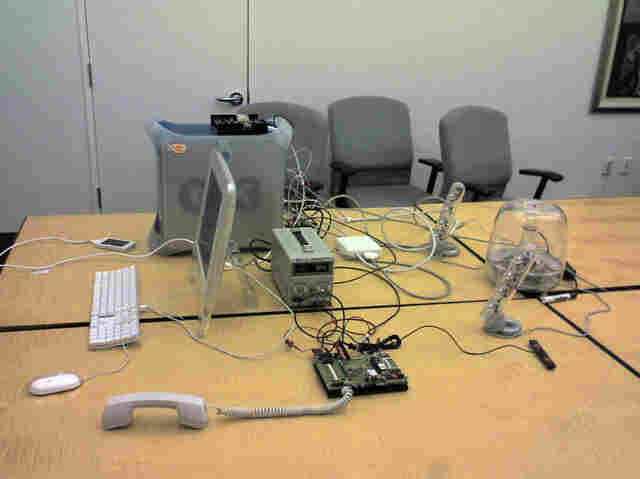 This room was the birthplace of the iPhone — and even after a remodeling it's still not an impressive place. The office is next to a bathroom that occasionally leaks. A decade ago it was outfitted with a stained carpet, a tattered poster of a chicken, and castoff furniture. But it was completely secure. "You know, the cleaning crews weren't allowed in here because there were these sliding whiteboards along the wall," Christie said. "We wouldn't erase them. They became part of the design conversation." To get in you needed a special code. Inside, Christie, his team and Steve Jobs hashed out the ideas that became the iPhone. Years later when Jobs and Tim Cook would talk about the experience of using this phone they tended to use language like intuitive — and simple. "It just works," is how Jobs often described it. The iPhone was so easy to use, a baby could pick it up and flip through pictures. The design choices built into its software seem obvious. But when Christie was first pulled into the project nearly 10 years ago, he and his team were confronted by a blank screen. Very little of this seemingly intuitive software existed. "The early demos of the phone were like sketches," he said. "They were like idea fragments. I don't have the right words to describe it. It wasn't like this was a complete phone call experience — it wasn't end to end on anything." No one had built a phone without buttons before. A touch screen offered software designers like Christie freedom, but there was no design language they could grab on to. How would you turn this phone on? How would voice mail work; how would you open an app, or answer a call? "These guys would basically be tasked with, from scratch, redefining a cellphone, a smartphone," said Greg Joswiak, who was part of the original marketing team. "There were literally a thousand things these guys would have to invent," Joswiak said. They came up with multiple solutions for every little problem, try them out, tweak, and start over. It was painful and slow. "Steve was growing increasingly frustrated each time we reviewed it with him," Christie said. "He wanted to see a path." Jobs wanted a product, not fragments or rough ideas of how something could work. And so in 2005 he issued an ultimatum: Christie's team was given two weeks to come up with something real — or Jobs would find another team of designers. Christie had come to Apple years earlier — in the '90s, during Apple's dark period — before Jobs returned to the company. Christie came because he wanted to work on the Newton, Apple's first mobile device. "I was convinced that very, very interesting things can start happening when you have software running in everyone's pocket," he said. The idea of being able to access the Internet from anywhere seemed remarkable. Ultimately, the Newton failed in the marketplace. The project was killed in the late 1990s. For Christie it was like losing his chance to play professional baseball — nothing was ever going to be quite as good. And then he was asked to work on the iPhone. "Like a decade later," he said. "As if somehow time has no effect on you — the aging process has stopped and you get that phone call you get to make it out of triple A." This was his dream. That's what this phone project was for him. And now in early 2005 — with Jobs frustrated and angry — Christie worried that he was about to blow it. Over the next two weeks his team worked nonstop, slowly weaving its "idea fragments" into a cohesive whole. Slowly, they knit together a vision of how this phone would work. "I have no doubt that if I could resurrect that demo and show it to you now you would have no problem recognizing it as an iPhone," Christie said. When Jobs walked into their dingy little windowless room, Christie knew they would keep the project. "Yeah. We got it," Christie said. "And that was the reaction from Steve: He was blown away by that demo." It took nearly two more years before those ideas would be unveiled to the world as the iPhone. In the end, Christie and his team ended up shaping a device which hundreds of millions of people now carry in their pockets. Gestures they created are now second nature for millions of us. And today, on the eve of Apple's second patent trial with Samsung, he insists that company simply ripped him off. He says when you pick up a Samsung phone, "you go from app to app and you start recognizing things." Little things — like where controls were placed — and big things. "It's not just the possible arrangement of controls but what the controls do, what we enable the customer to do," Christie says. The iPhone went on sale in 2007 and by late 2008 Android phones began to hit the market. In its upcoming lawsuit with Samsung, Apple claims its rival should have to pay $40 per phone to license Apple's ideas — including tiny little things like the slide-to-unlock screen. It's a claim many patent experts have called ludicrous, pointing out that hundreds of thousands of patented technologies go into every phone. Samsung declined to comment for this story, saying only that the company preferred to make its case in court. In court documents, Samsung's attorneys have argued that some of Apple's ideas were so obvious they shouldn't be patented at all. And Samsung is also countersuing, saying that Apple stole some of its patents — including ones Apple needed to make its video calling app, FaceTime, a reality. As these lawsuits have dragged on year after year, both sides have spent countless hours and tens of millions of dollars on litigation. It's become more difficult for Apple executives to explain why the company can't let this litigation go — why they don't stop fighting about the past and focus on building the future. And questions like that can set them off. Christie and leaders at Apple believe they were ripped off. Within Apple this isn't really seen as a battle for market share or profits or lost revenue. In fact, the feelings driving these lawsuits may not be rational at all. Apple's executives insist Samsung stole their ideas, and they tend to see this legal fight as a battle over right and wrong. The latest case is scheduled to go to court next week.